The Canadian Naval Technical History Association is made up of a group of volunteers, many of whom are retired Naval Engineers. A prime purpose of the CNTHA is to make its information available to researchers and casual readers alike. The archives comprise papers, presentations, oral histories, publications, etc., in other words the bulk of the archival and member contributed content of the site is found here. The goal of the links page is to direct readers to related material found in external sites. While we try to keep these links current, we cannot be responsible for the content of these external resources. In the coming months we will be reviving the gallery section of this site. We would appreciate any contributions, particularly if they help illustrate the technical theme of this site. Members of CNTHA welcomed Captain (N) Rolfe Monteith, visiting from the U.K. 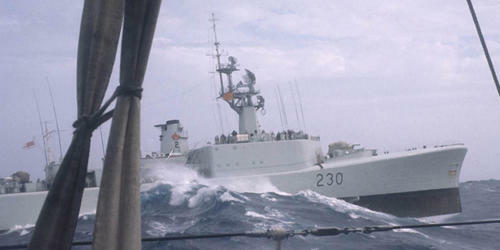 In 2001 Rolfe launched the Canadian Naval Defence Industrial Base (CANDIB) subcommittee of CNTHA. DHH has an ongoing project to capture and preserve our country’s naval technical history. Interested persons may become members of the CNTHA by contacting DHH or the CNTHA Chair, Pat Barnhouse. Goals A1 through A4 will be achieved through the Oral History Program and our Working Groups. Increase accessibility to Canada’s Naval technical history. Goal B will be achieved through this website and through various communications activities.